Recanati professor of medicine Jerome Groopman has, for decades, been among the very rarest species of triple-threat medical professionals: a superb clinical practitioner, at Beth Israel Deaconess Medical Center; an accomplished academician, at Harvard Medical School; and perhaps the best explicator of medicine and medical research for lay readers, through his writing for The New Yorker and The New York Review of Books, and in his own books. Perhaps drawing especially on the last of these talents, he is also a superb teacher of undergraduates, as reported here. It is a pleasure to direct new readers’ attention to this 2000 profile of the remarkable Professor Groopman. Why is it that so many doctors feel compelled to write, and that so many do, so compellingly? William Carlos Williams, Ethan Canin, M.D. ’89, Lewis Thomas, M.D. ’37, S.D. 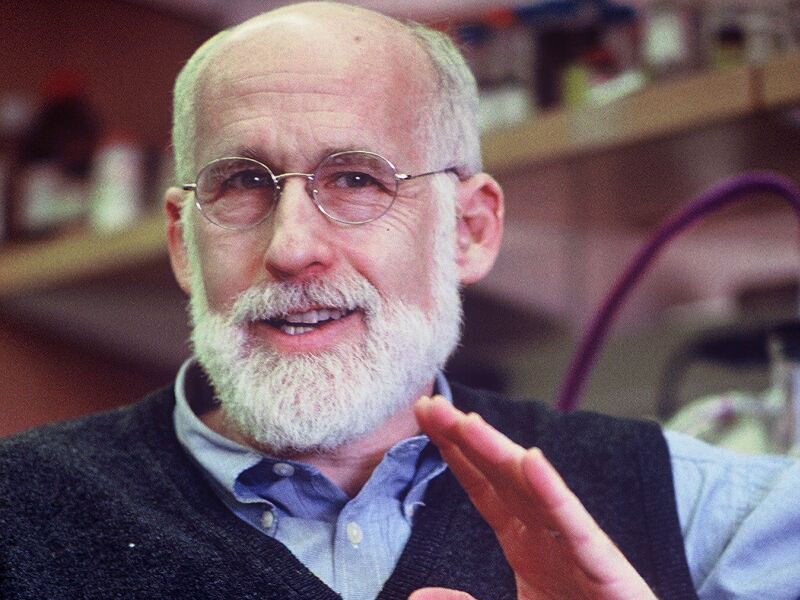 ’86, Oliver Sacks, and now Jerome Groopman, Recanati professor at Harvard Medical School and chief of experimental medicine at Beth Israel Deaconess Medical Center, who began writing just four years ago at the age of 44. In that time he’s produced two books and become a staff writer for the New Yorker. At 4:30 a.m., when there’s no trace yet of morning light in the January night sky, Groopman is already up and working. During the next two hours, he will write and revise: stories from his own experiences, book reviews, articles. His stories are what might be called medical case-history thrillers. This branch of nonfiction can make powerful reading. In the hands of less-skilled practitioners, the genre amounts to “earnest doctor fights mysterious or terminal disease in heroic attempt to save patient’s life,” but Groopman’s characters, deftly rendered through the prism of his own moral perspective, spirituality, intelligence, and compassion, almost come to life, in the tradition of the best fiction. At 6:30 a.m., Groopman abandons the pen in favor of the sword as, over the next hour, he and his wife coax their three children, ages 17, 11, and 7, out of bed, to the breakfast table, and off to school. Then he mounts his exercise bike and reads the Wall Street Journal, New York Times, and Boston Globe as he pedals. Groopman exercises twice a day against the possibility that he might suffer the same fate as his father, who died of a heart attack at a relatively young age. Then it’s off to work at his laboratory. Groopman’s clinical practice in hematology (diseases of the blood), AIDS, and cancer is world renowned; in his lab, he and an elite team of postdoctoral fellows also study neurobiology. The complex clinical cases that Groopman writes about often lie at the intersections of these fields. Many of his patients have exhausted all proven treatments and come to Groopman as their last, best hope. He keeps pictures of some of them, including the late King Hussein of Jordan, in his office. For those who have died, his stories serve as a kind of memorial. The desk in Groopman’s office is piled high with the scholarly books and scientific journals necessary to stay current in his field—titles such as Blood, Cell, Nature, and Science. He also reads widely for pleasure, about a book a week. Brian Greene’s Elegant Universe—“beautifully written,” he says—is a recent favorite, as is Roddy Doyle’s story of a boy growing up in Ireland, A Star Called Henry. In person, Groopman is warm and funny—the perfect doctor. When asked, “How did you begin writing?” he pauses a moment and says, with a broad smile and a twinkle in his eyes, “I love my wife.” Then he pauses again. This charming non sequitur proves to be an elliptical answer to the question. His wife was the first person to read his stories, back in 1996. “She told me the truth,” he says, that “they were terrible.” He rewrote and revised. Then, with the encouragement of his friend Martin Peretz, publisher of the New Republic, he took his work to New York and showed it to 11 different publishing firms. One publisher told him, “There are seven steps in character development, and you’ve missed a few”—and then went on to instruct him that every chapter ought to have an epiphany. There were rejections and more requests to rewrite. Today, Groopman is a staff writer in medicine and biology for the New Yorker, an honor he calls “amazing,” “a gift,” “maybe equal to Harvard tenure in terms of prestige.” A friend’s agent brought his work to the attention of the magazine, which offered to buy a chapter from what would become his first book, The Measure of Our Days. That chapter was the story of “Kirkland Bains,” an investment banker afflicted with kidney cancer that had metastasized throughout his body. When he came to Groopman, other physicians had given up on him. Searching for something beyond the ostensibly hopeless prognosis, Groopman saw in Bains an intense will to live, and took him on as a patient. After a few weeks of risky and unproven treatments, a recovery was well underway, miraculous by any standard. Bains went home. Four months later, he was back, and so was the cancer. But the fight Bains had shown during his first bout with the disease was gone. Confronting death, he had examined his own life and found it worthless.